Plaça Rovira i Trias is an unpretentious little square that retains an authentic barrio feel to it, lost to a great extent in Gràcia’s trendier squares. 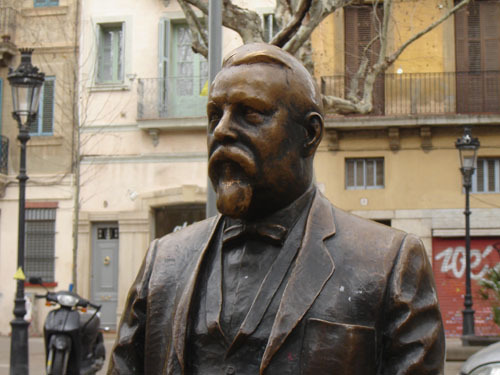 Check out the forlorn seated figure of the square’s namesake staring into space with his grand plan for Barcelona lying in bronze at his feet, rejected in favour of Cerdà’s Eixample. The design of Rovira i Trias actually won the council-organised competition but Madrid imposed Cerdá’s plan. The conspiracy minded have claimed that it was because its gridlock streets allowed troops to be quickly rushed to the centre in the very likely event of rebellion, but according to Robert Hughes in his brilliant Barcelona, it may well have been that the progressive administration in Madrid preferred Cerdà’s plan because it was more akin with their ideals, and because he was just a better lobbier. Whatever the case, the better project was bestowed on the city, and Rovira i Trias’ more conservative plan for concentric rings emanating out from the old city was consigned to the dustbin of history. Bar Flandes on the corner has a pleasant terrace serving huge portions of good bravas and other tapas.